The website is such a great resource and, as a movie fan and movie buff, I enjoy delving into the articles on the site. I really love your website! It's such a valuable resource. I live in Sydney, Australia, and feel fortunate that we have 3 cinemas that play 70mm films. .....thank you for running this wonderful web resource. Thanks a lot for keeping this list and running this site! Thank you for a wonderful website celebrating all things 70mm - it's fantastic! 60 years have now passed since the tragic death of Mike Todd on 22nd March 1958 in a plane crash aged just 50. So sad one cannot begin to imagine what else he would have gone onto achieve in his career, when you look at ’’Around The World In 80 Days’’ a Wide Screen Todd-AO Spectacular Amazing Movie. This man was truly a showman, and as he stated, a BIG Wide picture projected through one hole and the pioneer of 70mm Todd–AO!! Bravo. Mark Lees, ex-projectionist, Wallasey, Merseyside, UK. Great site guys. Keep up the good work. You are the only ones doing it. Keep the Wide Screen format alive!! I'm an Indiana University student here in the States and independent filmmaker. I absolutely love in70mm.com. I discovered it when "Dunkirk" came out, and now I visit it every day for movie news. Thank you for all the time and effort you put into what I consider the best site out there for our small -- but passionate -- 70mm niche. I run a couple of Facebook groups related to World Fairs and Expositions or Expos and your site provided quite a bit of very useful information that I had not come across elsewhere on the web. With your site I was able to find and share clips from a number of different Expos with fans of those Expos. There are separate groups on Expo 67, Expo 37, Expo 58 and Expo 70, all of which will be visiting your site to see more details about the films they saw when they attended their fair, which is one of the things most Expo fans really enjoy. So on behalf of those other fans, my thanks. Just posted this review on Amazon re Blu Ray of "South Pacific" hope you approve. Perhaps you can pop this on your 70mm page which as always is fantastic nothing else on the web like this keep up the great work well done. This is a great site. 70mm is fabulous. We love what you do and keep up the great work! As always, thanks for your work. It is clearly having a benefit. Thanks for the great work and content on the site. I often find myself digging through unread sections. Thank you for your work and for your wonderful website. Your impressive website is a profit in my life. Firstly, as someone who has seen most of the classic 70MM and Cinerama productions of old, theatrically, let me congratulate you on a fine web-site dedicated to this superior film format. I felt to advise you that IMAX Melbourne has decided to re-install their 15/70 IMAX projector especially to show "Dunkirk". I might also add that the Sun Theatre Yarraville is my 'local' cinema and I will also see the picture there. The quality of presentation at this cinema is always first class. Your web site is wonderful. I'm former professional projectionist from Pilsen, Czech Republic. There was cinema EDEN for 70 and 35mm projection. Two Meopta UM 70/35 projectors. "My" cinema was the HVEZDA, STAR. Both cinemas EDEN and HVEZDA were closed. Projectors ended up God knows where. Now I'm fan film only and the technique aspect. I work in a hospital in Pilsen and is now 58 years of age. Best regards and big thanks for your work! And thank you again for your very beautiful internet site! VERY FANTASTIC SITE! All the dreams of my life are in your site! A big thank you for your bulletin! Not only is it enjoyable but educational as well. THANK YOU! Just to say I get the newsletter and really appreciate it, even though I don't get to events. It's a great resource for '2001'. I'm working through both the Kubrick archive in London and the Clarke archive at the Smithsonian, slowly putting together the full historical story. But nothing can beat in70mm.com for the sheer quality and accuracy of its material. Continuing thanks for everything. Thank you again for all your site does for the film world. Wishing you and everyone at IN70MM, a Merry Christmas, Happy Holidays and a Happy 70MM H8tefull8 New Year. Thanks for producing a comprehensive website for true film fans, and 70MM enthusiasts. All the best! Keep up the great work; in70mm is one of my favorite websites! Good Morning, Wonderful and informative, love your web site. I attended the showing of "HOW THE WEST WAS WON" at the Cinerama Dome yesterday. It was great and I am very thankful to you and your site informing me of this. The man who introduced the film (he use to be the projectionist there and currently is a consultant for their three strip Cinerama showing) announced there was going to be a Widescreen Film Festival at the American Motion Picture Academy’s Samuel Goldwyn theater in Los Angeles this May. He mentioned there would showings of films shot in TODD-AO, Super Panavision 70, Super Technirama 70 along with VistaVision films shown in 35mm. I haven’t been able to find any announcements or schedules on the internet but I have always found your site as a reliable resource for 70mm/Cinerama information. I would think you would have more means to find out about this festival than I do but if I do discover any dates, I would definitely pass them on to you. Thank you for your excellent global coverage of 70mm film happenings. We love your website for so many years! Thank you for your precious and irreplaceable help in spreading the word of 70mm worldwide. I have visited your site a number of times over the past few years and wanted to let you know that's it's great to see so much information in one place about 70mm. My father was the chief Projectionist at the Drake Cinema in Plymouth when it opened in 1958. We had moved from Essex (on the Steam Driven Cornish Rivera Express) for him to take up the job, having previously worked at the Plaza, Leicester Sq. London for a number of years after his demob from the Royal Australian Air force after WWII. I remember the many visits I made to the cinema with my father to the projectionist box and would spend many hours watching some of the films that was shown from the little window next to the projector. Great to see him in some of the article pictures about the installation, great history documents. I just recently discovered the site in70mm.com and can't get enough! I am currently working on a "roman à clef" novel that I plan to someday adapt into a screenplay and have shot on 65mm film. I'm writing from a tiny little city on the east coast of Canada and just wanted to say that I love film. I started shooting film stills when I was just 7 or 8 years old and eventually I found myself brainwashed into switching to digital. Only after my career in digital post production took off, did I finally wake up and realize that film is really the only way (in my opinion) to shoot a movie. Thanks for continuing to do what you all do! Your website is great. I admire and appreciate it as a very usefull and rich source of many rare information. Thank you for it. Hello Thomas, What a great section [Todd-AO Equipment Catalog] on your site!!! This is a great record of the depth of the undertaking of the Todd-AO process. GREAT JOB!!!!!! Thank you, Thomas, very, very much. I've always wanted to tell more people on what I saw back then because I've always seen questions inquiring on what was missing. I thought your website would be the perfect vehicle. I monitor your site devotedly. I really miss those 70mm movies. Keep up the great work. Thank you again. The web site is amazing, with so much information on it. I really do enjoy reading the stories and news items you both produce. The John Mitchell Cinerama weekend in Sydney looked fantastic. I must ask Eric White all about it. What an absolutely fantastic site, and the piece about IB Tech film was so well written and enjoyable to read. It's great to see someone's passion. Thank you. Thank you for keeping up the history that it seems Hollywood is neglecting. Hi Thomas, I found your website very informative on 70mm. Your unofficial titles are Great in the Staff page (Mother Theresa of 70mm :)). My Thanks to all team members for sharing your knowledge and passion for 70mm through your website. I was in bradford in April for the first time, i was so happy i finally see a Cinerama presentation. It was the first time in my life, i always dreamt of it! i was born in 1965 so i could not have seen it ! Dear Thomas, My sincere compliments for your excellent, excellent, site with a lot of pieces about the latest developments of Cinerama and 70mm The Master! Great Job! Hi Bill, I've just spent some time reading your site and wanted to congratulate on it - fascinating information! I have long enjoyed and admired your terrific website. Your site is phenomenal! Thanks for the great work you do. Thank you for the magnificent work you have done. Dear Thomas, Thank you for taking care of the 70mm website. I am regularly checking it. Thank you for putting up this site. It is an amazing site, educating people, like myself on 70mm, a large film format which was used as the format used to shoot epic films and musical films from the mid 50s to the early 70s. I am of the youngest generation, and I'm upset that most people my age don't know this format. When I grow up and become an animation film director, I'll use 65mm for most of my animated motion pictures. Again, thank you for setting up this site. .....thanks again on behalf of all 70mm fans for your magnificent website! I can't thank you enough for giving this humble admirer a chance to actually be published on an international authority site. "Humble" is not the word. Your site is so important to so many people around the world who love the big screen cinema. Preserving what we all remember and still love as being the forerunner to today's modern technology is so important to those of us who learned to love cinema before the technological age of IMAX. CineMiracle, Cinerama, Ultra Panavision 70, VistaVision, Todd-AO and all the rest were what made movies "events," and not just Saturday afternoon time-wasters. Your efforts, and those of your contributors, help preserve what movies were all about. I believe that's what it *still* should be about. Technology is one thing, but nostalgia and the memories of our experiences as they were can't be replaced. Thank you, my new friend. Please keep me informed about new developments in cinema as we knew it. Your Site is a really excellent one and VERY interesting to delve into - much appreciated. Your website is one of my favorites being a Cinerama and 70MM fan. Your adaptation of my 2010 Bradford article for the web is great as always. The 70mm website still amazes me every time I visit it !!! Your MBKS was very well deserved !! Thanks, as always, for the site! I love your site as do many of my projectionist and 70MM enthusiast friends. I'm a 22 year old film enthusiast from melbourne, australia. i've been obsessed with film for as long as i can remember and i just wanted to let you know just how much i appreciate a resource like your site. Having to trounce my way through library books, online resources, dvd special features & commentaries etc. in search of really solid information especially about 70mm is a hard slog but your site is a complete revelation. I can't describe how impressed i am! i could spend hours on your site each day. Again...INCREDIBLY appreciative of this great resource and all of you and your team's work! i look forward to trying to hunt down some of the cinemas listed on your site. Just fell over this site, what treasures. I continue to be impressed by the dedication you have to the continuing wellbeing of 70mm. I would like you to have met my colleague and friend, the late Robert Gottschalk, founder and driving force of Panavision. He was of the unshakeable opinion that picture quality, real picture QUALITY, depended on a big piece of negative, the bigger the better. Hello Thomas, I am a keen 70mm film fan and would like to congratulate you on your efforts in keeping 70mm alive and in peoples thoughts in this crazy 'digital' world. Thanks also for supporting me and my teams success (projection team of the year) on your excellent web-site. I'm always impressed by all the stuff I see you are doing on the web for 70mm, Cinerama and wide screen showings everywhere. Seasons greetings from Culpeper, Virginia! President, Cinerama Preservation Society, Inc. Your site is soooooooooo good and you are soooooooooooo good to contribute your time effort and money to do this! It is I who has to thank you, Thomas. It is a pleasure to share the love for movies and 70mm that I have with anyone who has the patience and the persistence to build a dedicated site like yours, I mean it! I'm an absolutely 70mm Freak and love your fantastic Site! It's THE BEST of it's kind! Your 70mm internet site is famous, it is the only one a prefer!!! Have been scoping out your site for a while looking at all the information. Invaluable. Thank you very much. Thanks for your website. I cant get over how good your website is and how good all the material on it is too. The amount of cross referencing is superb! I have recently come across your wonderful website and I wish to compliment you on it's content, well done. Attached is a photo of my original 1960 UK "The Alamo" In Todd-AO (1960) Quad Poster, it is quite rare as there were not a lot printed with the Todd-AO symbol on it. Anyway I thought you might like a copy for your website? Please keep up the wonderful work. You have really done a splendid job with the website. Your website is truly a great resource! We've found a lot of helpful information on your website www.in70mm.com and are open for any suggestions you might have. ...btw, your site is looking VERY good. I'll come back later and take a long, long look. Your site is wonderful. Absolutely wonderful. Thank you for your efforts in continuing providing 70 mm enthusiasts like myself with such a great web site. Barabbas opened at the new Odeon Haymarket 4 JUNE 1962 not February as stated, this date is in my book on West End cinemas and to double-check I looked up The Times Newspaper Archive which confirms date. Tom, thanks for your wonderful website! Thank you for maintaining you DP-70 and other 70mm web sites. They are an inspiration to all of us who care about these fine machines. Congratulations on in70mm.com This is a unbelievable resource and your dedication and enthusiasm is mind boggling! Keep up the fantastic work. I'm sorry I never mentioned how much I enjoy your "In 70mm" newsletter. It is a truly monumental undertaking. Have just spent another two hours reading through yet again parts of your wonderful web site. I don't know how you manage to do it, but I for one am certainly glad you do. Every time I look at the site I find myself immersed in fond memories of Wide Screen as I remember it from it's glory days of the 50's,and 60's and to have someone like yourself capable of collating and bringing together so much information is fantastic. The site just seems to get better and better. Your web site is an outstanding tribute to the widescreen 70mm format. You might want to add the Esquire Theater in Denver, Colorado to your list of theaters that have 70mm projection capability. You've built a fantastic website which is always a pleasure to visit. Dear Thomas, was there forgotten the 70mm festival for the American Cinematheque? By the way, for my opinion there is too much public relation for the Schauburg Cinema on your website, including no commented screenings of 35mm prints (as Ben-Hur) or German dubbed prints (DIE HARD, ABYSS, ALIENS and so on). The advertising spaces in favour of Mr. Born are exaggerated, I think, and his "historic transfigurations" of the wide screen history in many internet forums and discussions are a real torture for a couple of experts. Nowadays an important share of his program is carried on HD(TV)-Screenings via DLP beamer - altogether "harmonious" living side on side, as Mr. Born mentioned. After many years I regret to notice, that this man is not fully serious - a very fickle and changeable business man with nostalgic weakness. The historic truth is another thing, I believe. I would be unhappy, as soon as the Thomas Hauerslev website is changing into a Herbert Born website. The other, more interesting Festivals (American Cinematheque, Norsk Filminstitut and the Czheck festival) come off to shortly for my taste at the moment. I am a great fan of your website and enjoy it on a daily basis. Great job. Wow.... This is AMAZING ! 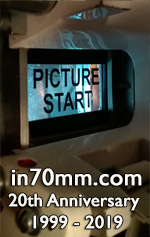 I like your website "in70mm.com" very much! It is very interesting and nice to read. ... you do a lot with your website, this is a kind of place to meet, like a pub where all are going after a hard day of work to see friends and talk about common things and drink virtual Hoepfner brew in form of new articles and/or impressive screenings schedules ... it helps us a lot ..
in the beginning many many compliments and thanks for your fabulous work with the website and for your passion about the 70mm. I would like to make you a question please: have you ever been in italy seeing the Arcadia multiplex in Melzo ? Well, if the answer is yes, you just know what i am talking about !!!! If the answer is no, i'd like to invite you to spend your next holiday there, that's the real seventh wonder of the world. I'm a fanatical about 70mm and large format, and I will take this few seconds to say that you will never and repeat never say a cinema like that all over the world. If you need more information I will be pleased to send them to you. Bye Bye and many compliments again. I've been a fan of your website for years. helping to keep that great 70mm feeling alive! Thanks for this memorable site of the story of DP70. I have worked more then 30 years with Philips and Kinoton projectors, every day on my work as projectionist I see my DP70 out of working, its still a stanby-projector waiting for ......!!!!! Thanks for posting the pictures you took at the "Ryan's Daughter" locations in Ireland. I'd love to visit those places myself, but your pictures were the next best thing. Found your website while surfing on Google . Wow ! congratulations on your fascinating work. I am retired now , but worked on the DP70's at the Regent Theatre, Wollongong Australia. The theatre has now closed but I believe the machines are still there . From what I hear they are hoping to have the theatre heritage listed . In the early 70s I was the envy of all the projectionists on the south coast of New South Wales, as we were the only theatre to be running 70mm ! I have a few photos if they are of any interest to you . I really enjoy the information on your website. Jim Cassedy, San Francisco, USA. Dear Thomas, I look and admire your site since a few years now! About 3 or 4 years ago, I send you a encouragement mail and you make me a kind reply (Again, today I would like to re-new all my encouragements for your work and the increasing richness of your exceptional site. Tonight, I had the very great surprise to see the DP70 brochures! I immediately downloaded the pages of this documentation. Of course, I regret I can't thank you directly, face to face with a good drink, but be sure I would enjoy to guide you and/or help you if you want to come again in Paris or around here. Great work on your website. It's a wonderful resource for all of us interested in the widescreen experience. This is one of the best designed websites I've seen! Love your website. Very informative as well as helpful. Will spend more time surfing when I can get the time. Maybe even offer a few new tidbits for you. ...your 70mm website is going from strength to strenght - keep up the good work!. I just wanted to pass along thoughts and well wishes for your excellent web site. It's an excellent compendium for people like me who love movies and great theatre experiences. Keep up the excellent work and continued success for the website. Keep up the great work on 70mm, you'er doing an outstanding job. Hi … wonderful site – just terrific! I am delighted to find your website, with its encyclopaedic discussion of the history and technical features of this legendary projector. As a youngster growing up in 1950's NYC, I had the benefit of viewing films at nearly every DP70 installation. I can attest to the truly magnificent images this projector provided for the top run films of that era, including "Ben Hur", "Oklahoma! ", "Porgy and Bess", and "Lawrence of Arabia". Aside from IMAX, the conventional movie multiplex "experience" of today is simply pathetic, digital surround sound notwithstanding. The pitiful remant of a screen, devoid of curvature, appropriate size or even a dignified curtain makes the theatre going experience practically irrelevant. At least in my own home theatre, we properly dim the lights as the film begins, especially in the old "roadshow" spectacles that have "overtures" - e.g. "Ben Hur" and "Lawrence". I am really glad to learn that Bob Harris has two DP70's to view the marvellous results of his restoration efforts. I find your website very informative and helpful. For example, I will be seeing "Mad World" next week while visiting Washington because of the information your site provided. (I am a US government worker employed in Germany.) Again, thanks for providing a great service that helps to keep 70mm alive. I want to give you kudos for the new site updates. I like the new layout very much. The colors and easier access make the site even better than before. Just discovered your truly stupendous website - many congratulations. Congratulations many times over, again. I just found your wonderful site, full of info about the many films and formats that I enjoyed in my youth 40 and more years ago. I just had to tell you that as a schoolboy I saw TIC as the London Casino in 1955 never realising that six years later I would work for Cinerama as a projectionist at the London Coliseum and Royalty Theatres and also relieved at the Casino. I left Cinerama and went out of the industry in 1963/4. However the one big memory that I have always carried with me is the Cinerama flight in This is Cinerama down the Grand Canyon. It has always been my life ambition to actually see the Grand Canyon for myself. I was lucky to be present at the first showing at Bradford and meeting John Harvey, John Swadkins and Willem along with others from all over the world, including other ex Cinerama projectionists. After seeing TIC again after all those years my dream of seeing Grand Canyon for myself became even more pressing. Finally after have had to cancel 3 arranged trips to America following a heart attack and heart bypass, a family illness and death and on the third occasion Sept. 11th 'Twin Towers' two days before my flight out from the UK. I have made it this month and flew over and stayed at the Canyon. The 47 year wait was well worth it. I for one will never forget it or forget that it was Cinerama that was responsible for that lifetime dream. From an ex London Cinerama projectionist (Coliseum and Royalty plus a couple of days at the Casino). I would just like to say how much I am enjoying wading through everything that you have listed in The 70mm Newsletter-table of contents. I certainly never thought 40 years ago that I would enjoy reading about Cinerama as much as I am. If only it was possible to turn the clock back to then, perhaps we might still have more screens capable of showing 3 strip. When I attended the opening in Bradford of Cinerama and met all the people that had come from all over the world just to be part of the rebirth of Cinerama I had many a tear in my eyes. Now reading the items on your site is yet again having the same effect on me. Even after all these years I can still remember most of the films quite clearly and recall where a realignment of the 'gigolos' was called for. Keep up the good work and perhaps I might even be lucky enough to meet you at Bradford if I can make it next year. Thanks Thomas, an excellent site with so much information. I know many from here in Melbourne Australia who visit often. I would have loved this information 20 years ago but it just was not available. Keep up your good work. I regret you had to stop the paper version of "..in 70mm" for lack of new technologies in 70mm. But I will try to surf the net to have some news from you! The W/S weekend web pages are superb and you are to be congratulated. Well done. I have enjoyed reading back through the years. We have been fortunate to have seen so many historical films presented correctly. I am looking forward to the weekend which has some good films, in particular Spartacus and the King and I now that they have the DP70 which should keep the focus sharp on the curve. Stanley [Kubrick] would have liked you! The web pages are excellent. Great site. I miss all the 70mm films. Today, most screens are small. What happened to the large curved screens? I am a frequent visitor to your site and have appreciated the work you have done to make it so informative and interesting. Thanks for putting up this great site. Had a look at the DP70 site - great resource. You are making a remarkable contribution to 70mm history (and hopefully future). Your vast research and reporting on the subject are extraordinary. Congratulations and please accept my encouragement to continue your exceptional endeavour. You have one of my favorite sites on the net. Great work keeping the History of the DP70 alive. Tack för ditt fina arbete med The 70mm Newsletter genom åren. Your website is coming along quite nicely and is, as always very informative. Good luck on these new changes. A bad truth, Issue nr. 67 is the last one? Thank you for all the great past issues and your great work for 70mm film. Let's hope that some day producers will film in 70mm again. For someone like me who grew up in Hollywood in the heyday of 70mm and Cinerama, your website is an absolute delight. Thanks for your fine work. I can tell you that the finest cinema I've experienced, by far, with the best 70mm projection, was the old Carthay Circle in Los Angeles, which tragically was demolished in the late 1960s. Nothing else I've seen could touch it, even Grauman's Chinese in its prime. Hi, you have a wonderful site on the best projector ever made. Great work! I've just looked through the magazine and site and am very impressed. I was sorry to hear of the discontinuance of ...In 70mm in printed form. It was a terrific publication, I will really miss it, but then Kodak may also be abandoning their printed edition of Cinema Notes so I guess this is the future! Keep up the good work, I will continue to support ..in 70mm. You have done an outstanding job with publishing "..in 70mm" and I congratulate you on having continued to produce such great material for as long as you did. Most people that put together newsletters or small magazines tend to get "burned out" and give up in about 1½ to 3 years. The fact that you continued for so long shows how strongly you are interested in the subject of 70mm. I have been visiting and will continue to visit your excellent web site. I hope you will continue to add to the great things that are already there. Thanks for your great and useful site about large formats; I found it while I was searching the correct projection ratio for Disney's "Sleeping Beauty" (now reedited in dvd in 2,35) . May I say many, many thanks for a great publication over the years, and that I understand your reasons entirely. Thank you for a great site on the DP70 projector and 70mm projection. I was sorry to read of your decision to stop producing the printed version of ..in 70mm. However I can understand that it must take some time to produce each edition and I can only thank you for all your efforts. I saw Bill Lawrence at Pictureville when I went to see "Who Framed Roger Rabbit" and was glad to hear that the documenting of the history of 70mm will be continued. In my view this was a very important part of ..in 70mm which should be continued before the first hand knowledge is lost for ever. In particular documenting the films produced in the former Eastern Bloc countries has been generally poorly covered elsewhere. I hope that the website can continue this work. Is it possible to send out a message when the Now Showing page of the website has been updated? It was only by accident that I found out about " Who Framed Roger Rabbit" and the Pictureville film listing never included it. Sorry to hear about the demise of "...in 70mm." It's frustrating to see the film industry somewhat embrace digital cinema and large format IMAX/Giant Screen instead of 5-perf 65mm/70mm. Where's the logic? Now, if the industry wised up and embraced Super Dimension-70, I think that would be wonderful. Then, "...in 70mm" could enter a new age of 65mm movies! I applaud your decision to publish on the website. I think the improved pictures will make this a worthwhile change. I was sorry that you are not continuing with the magazine as I have enjoyed it very much. Thank you for all your hard work. I have visited your site on the net and found it very helpful. Please keep up the good work as we value all that you do. I'm so sorry do decided to stop to publish it, but I understand you. No one seems to believe in 70mm but Arcadia, and it's really a pity that the moment we decided to move to the Large Format you closed the magazine that taught me a lot about 70mm and its history. 66 and 67 are great issues! Thanks. You made a wise decision to substitute with a new website. Although I am in no sense a cinema technician, your magazine has revealed and enlightened a "behind the screen" world that has always intrigued and interested me. It has been a delight to discover the latest issue waiting on the doormat for me. I applaud your efforts for the past seven years and will be happy to send the money you have requested. May I suggest that you consider sending out e-mails to your subscribers each time you publish a new issue on the web? I am ready to re-subscribe at any time. I think it is a great idea to put the magazine articles on the web instead of posting out printed copies. This is the way a lot of publications will go. David Coles also thinks that you are doing the right thing. Putting the magazine on the web will give more people a chance to learn about 70mm (especially the younger generation). I think changing your format to a web based style is an excellent idea. I do want to support it. Obviously I would like to have seen the magazine continue but I completely understand your decision given the fact that even 70mm blowups seem to be very rare these days. Many, many thanks for the countless hours you must have put into producing the newsletter over the past seven years, it was very much appreciated. I'll continue to check the website regularly. Many thanks for your wonderful efforts in producing the "in 70mm" magazine for so many years. Keeping 70mm alive was a worthy aim but sadly it looks like joining 3-strip Cinerama on the shelf of yesterdays wonder. A pleasure to hear from you. Your work, in documenting Mr. Todd's vision, is worthy of doctorial awards. I will answer any technical questions you have. However, I can not add anything that you have not covered. The Todd-AO process, especially the films photographed with the first bug-eye lens and 30 fps, are the best presentations, I have put on a screen. The DP70 is the finest moving picture machine ever built. It has never been equaled, and I doubt it ever will. Keep up the good work. Cinema will never be the same as when Mike Todd was with us.